The dependence on email as an attachment transport mechanism has created significant problems. 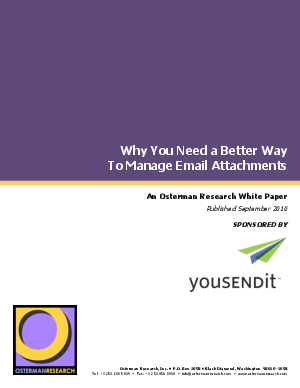 Because 98% of email traffic consists of attachments, performance of email systems suffers and results in slower message delivery and greater susceptibility to downtime. Other problems caused by the reliance on email for attachment transport include higher costs for storage and other infrastructure, an inability to track accurately if and how files flow through the email system, longer backup windows, longer restore times after server crashes, and an overall lack of control over much of the content that flows through email.